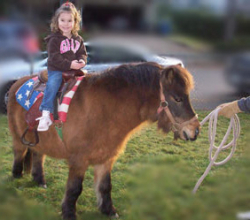 There's something special that happens when kids and ponies come together. Bring our hand led pony service to your next event. A great time for smaller events like birthday parties. For larger events we often recommend the ring of ponies. Ponies are hand led by attendant. Flexible. Can operate in a variety of locations. Rental of multiple ponies is available.